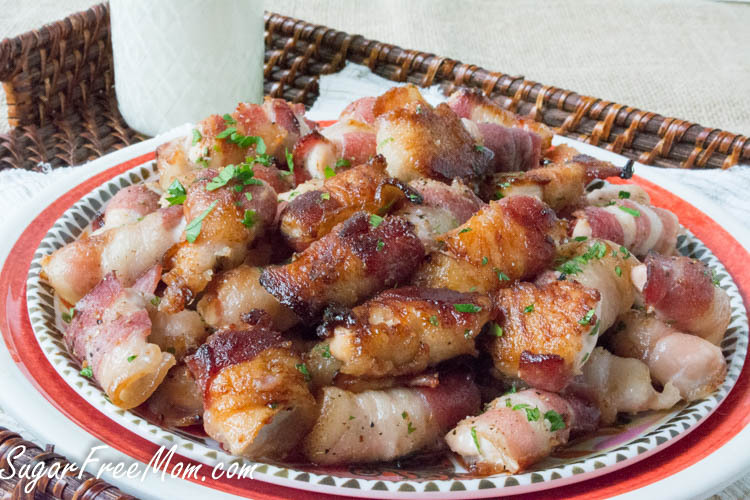 Sugar Free Sweet & Spicy Bacon Chicken Bites! 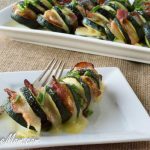 A low carb, easy finger food appetizer for any party! 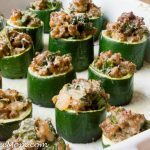 When I think of summer parties and easy entertaining I’m always searching for finger foods my kids enjoy but are still low carb. 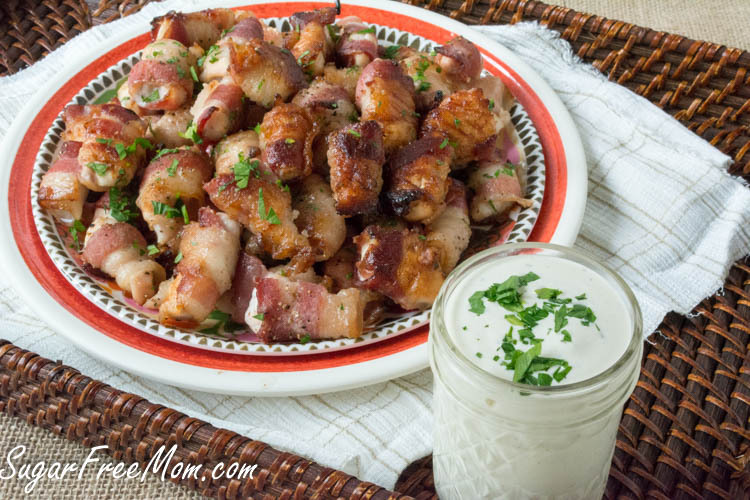 Dipping bite sized chicken wrapped in bacon into a creamy dressing like my homemade Ranch dressing from my cookbook makes for an awesome appetizer. These disappeared before I could have a few for myself! Aside from the necessary cutting of the chicken and bacon into bite sized pieces and mixing some seasonings and spices together, it’s really not that cumbersome. A few minutes of time in the kitchen, but if you get your kids involved in wrapping the chicken you’ll be free in no time! As you can see from the photos I have some crispier looking bites and some not so crispy bites. This is for one reason, dependent on what you bake it on and whether you want crispy bacon or not. 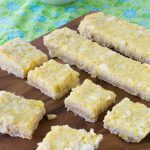 If you choose to bake these on a regular baking pan these will produce those crispy succulent looking bites. You can also place the bites on a cooling rack over a baking pan if you’d rather have less grease and less crispy pieces of bacon. Of course my kids and I liked the crispier bacon and my hubby liked the less crispy bacon. Either way they are sure to please everyone and bake pretty quickly. Please note you can make these spicier but since I was serving these to my kids I made them less spicy. These are only mildly spicy. 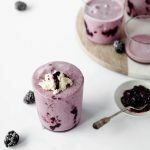 These can be enjoyed room temperature as well! 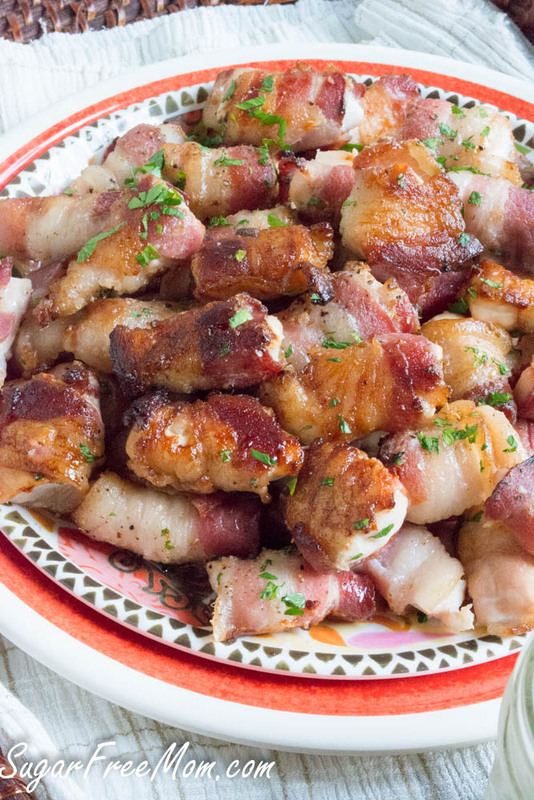 Wrap the pieces bacon over each piece of chicken. Line two baking sheets with aluminum foil or you can use a cooling rack over the baking pan. Whisk the last 3 ingredients together in a bowl and roll each chicken bite into the mixture. Place chicken bites on baking pans or cooling rack over pans. Prepare my Homemade Ranch Dressingto serve with. What are the directions for the sweet and spicy sauce? What kind of swerve: sweetener or confectioners? Either Swerve will work, I used granulated but confectioner’s is fine too. Just mix the last 3 ingredients and roll the bites in that before baking. You first had me at bacon and then at sweet and spicy. Perfect little appetizer bites! Anything bacon wrapped in my book get’s an A+! 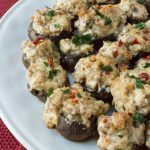 These look like a great go-to appetizer! Oh my – these look SO good. I love finger foods. And I’d definitely go for the crispy bacon! These look amazing. I just grilled some last week for a client. 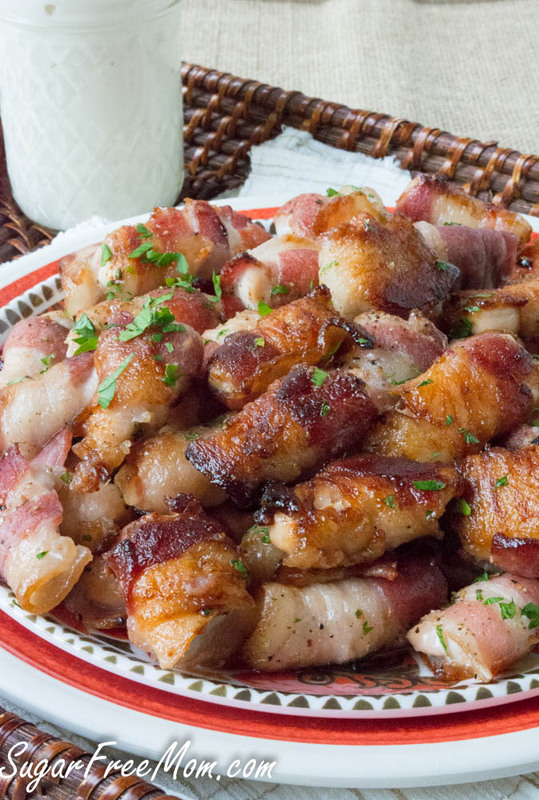 Nothing better than chicken wrapped in bacon. It’s so funny about how people like their bacon, I’m a crispy girl myself but hubs likes his lighter than me. I like mine almost burnt, no idea why. I love that you did these sugar free. And spicy. I need to dunk mine next time. I love dunkable foods. Is dunkable a word? 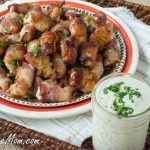 You had me at homemade ranch and bacon! 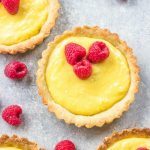 I love easy finger foods too and I don’t know if I could stop myself from eating all of these! 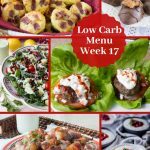 Since I’ve been recently eating a high fat, low carb diet, these are right up my alley. They look SO freaking good. I seriously can’t want to make these!!! These look so good! I love the combo of sweet and spicy….yum! Mmmmm, this is a family favorite of ours, actually just served it yesterday at a BBQ we hosted….we however use BBQ sauce. I like your take on making it lower cal! 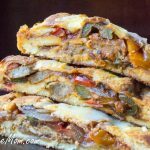 I made these for a get together with my inlaws and it was a hit………even if I omitted the sauce/coating (not enough time). Next time, I will try it with the coating. Thank you. Good Morning! 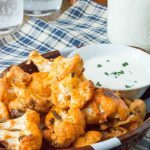 Just letting you know that I featured this recipe (and another one from your site) in a round-up of 50+ Low-Carb and Gluten-Free Superbowl Appetizer Recipes. Hope a lot of people will click over from my site and check it out! Thanks so much! I will share it too! 8 per serving or makes 8 servings? 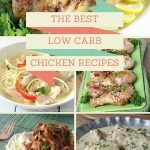 It’s 2 pounds of chicken which is 32 ounces and divided by 8 servings is 4 ounces per serving. Not sure how many bites that will be, you’ll have to weigh it.